Product review: – by Gill Tydie, 12 Sep 15 5/5 Excellent "Initial date had to be re-arranged due to flooded airfield but was not a problem and all done very professionally. Directions to venue were very clear and were easy to find. Very friendly and knowledgeable staff. Equipment very good. Enjoyed the flight very much and would love to do it again. " Imagine the thrill as you take the controls of a light aircraft for that unforgettable first flying lesson. After a short briefing from your flight instructor, it's time to take to the air where you will have plenty of opportunity to take the controls yourself and experience the sheer exhilaration of piloting your own aircraft. Your flying time even counts towards a Private Pilot's Licence so, who knows it could be the first step towards achieving this. 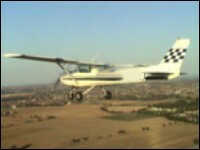 Flights are carried out by a fully qualified and experienced instructor in a Cessna 152 dual controlled aircraft. Clothing - Wear comfortable clothes and flat shoes. Spectators are welcome at no extra charge. Meals - Hot and cold drinks available at the airfield. Local pubs and restaurants nearby. I could contact easily but couldn't fly on the first date, needed more time to book ahead. It was clearly signposted and esy to find. Good facilities at Clacton airfield. The pilot was very friendly and reassuring and the office staff were efficient. It was everything I had hoped for and more. The flight was very exciting. I have already recommended it to my friends. Yes we took photos and films from the flight. All Flights4all staff very efficient. Very easy to get to and facilities were good. Staff very helpful and friendly. Excellent briefing from the 'Captain'. My son took the flight and had a great time. Flying the plane was amazing! !...took lots of photos and was not rushed. Initial date had to be re-arranged due to flooded airfield but was not a problem and all done very professionally. Directions to venue were very clear and were easy to find. Very friendly and knowledgeable staff. Equipment very good. Enjoyed the flight very much and would love to do it again.